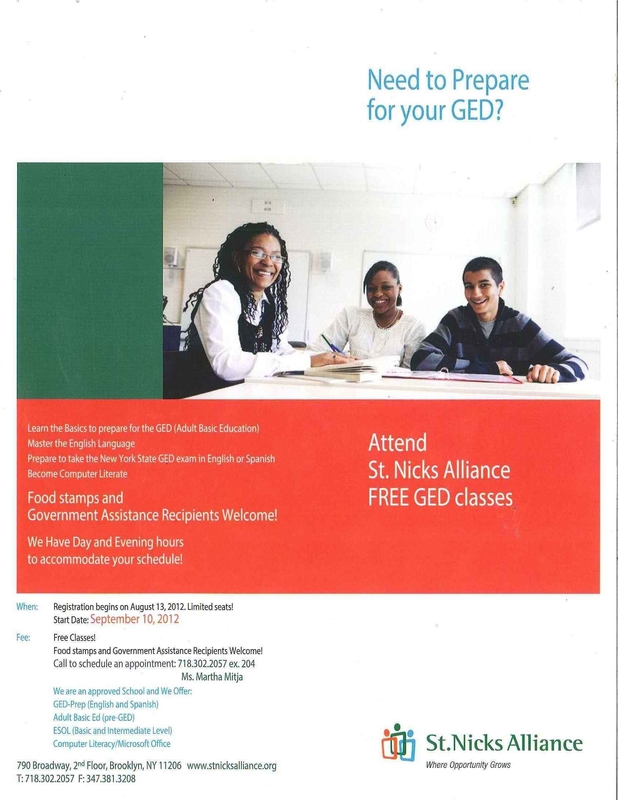 St. Nick’s Alliance is offering FREE GED classes! Food stamps and government assistance recipients are also welcome! REGISTER AS SOON AS POSSIBLE! LIMITED SEATS! 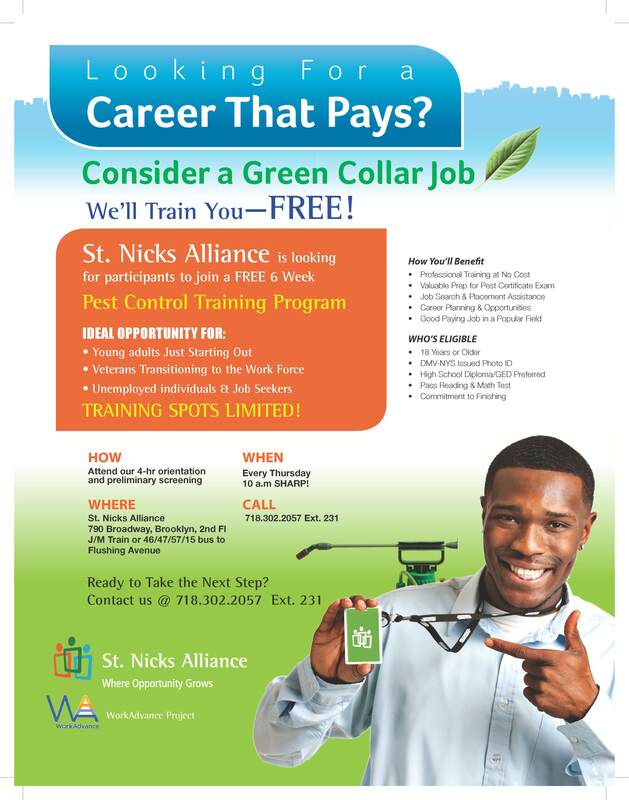 St. Nick’s Alliance is actively recruiting for their PEST CONTROL FREE TECHNICIAN CLASSES! This would help improve household income and quality of life! Students will take a 6 weeks course in preparation for a career as a Pest Control Technician/Exterminator. The students will get 30 hours of technical training needed to pass the 7A NYS licensing program. 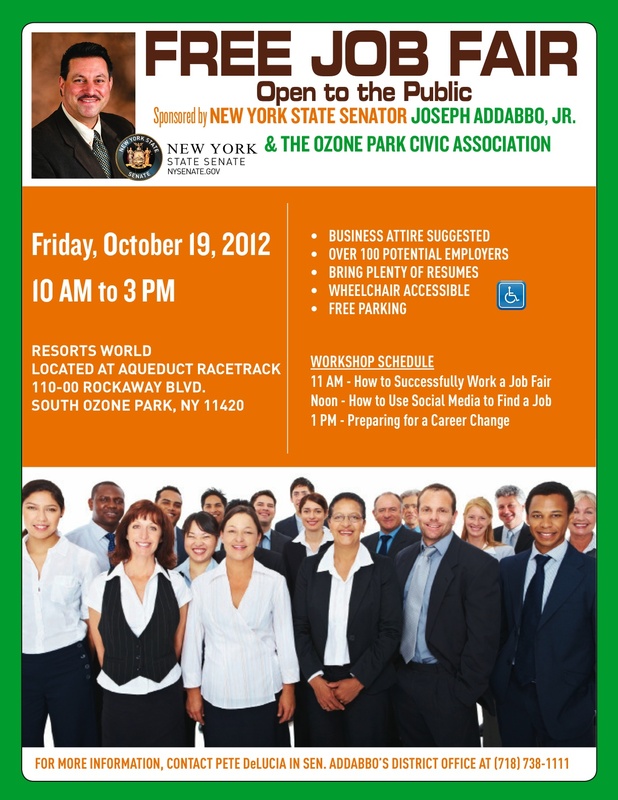 In addition to that, they will have job readiness preparation, life skills training, and industry guidance. PEST CONTROL Orientations are every Thursday at 10am. Anyone interested in attending a walk-in orientation must come with a valid NYS ID, Social Security card, and proof of address. They must also be professionally dressed to attend-no jeans or sneakers. Please expect to stay until 3pm, if they are interested in starting the program. – Is back from the military? – Wants to improve the relationship with the other parent of their child? – Wants to learn how to be a better parent? If you or someone you know fits into any of these categories, there’s a great and FREE opportunity awaiting you! 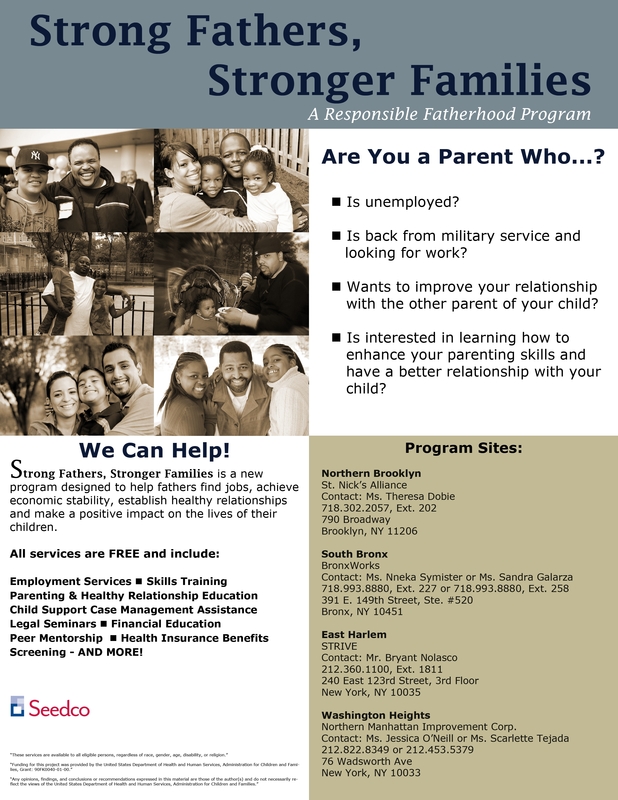 Contact the nearest program site (on flyer below) for further details about joining the program! 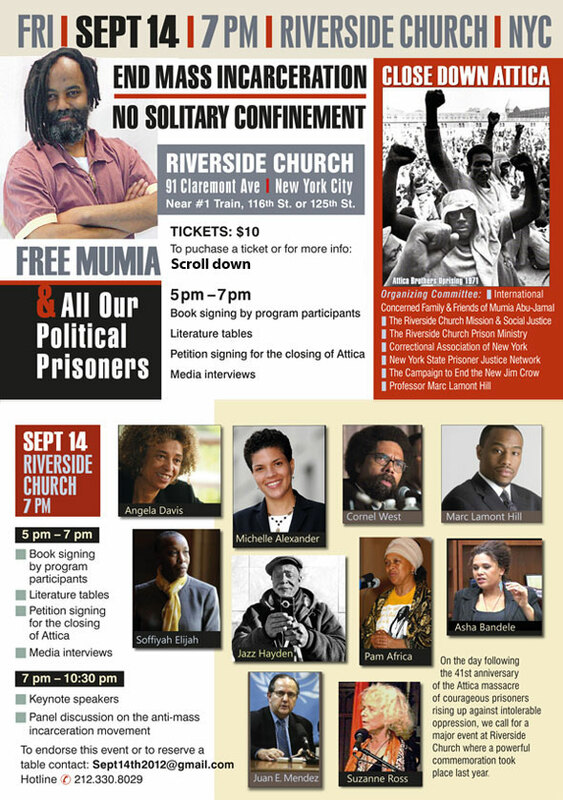 Join the FreeMumia Movement to End Mass Incarceration 9/14! Michelle Alexander, Angela Davis, Jazz Hayden, Marc Lamont Hill, and Dr. Cornel West. Additional speakers include: Pam Africa and Soffiyah Elijah. HBCU Connect is proud to offer the 2012 HBCU Connect Scholarship Program for HBCU students. The 2012 program makes available several $1,000.00 scholarships for up to 4 minority applicants who attend or plan to attend an HBCU college or university. The scholarship can be applied to tuition or books for the 2012 Winter or Spring semester. HBCU Connect as an organization is the largest student and alumni organization of Historically Black College and University supporters in history. Founded in 1999, HBCU Connect has given away thousands in scholarship dollars to deserving college students. The organization is dedicated to keeping HBCU students and graduates connected with each other and with opportunities for advancement. – Students enrolled or planning to enroll into any Historically Black College or University for Winter 2012 or Spring of 2013. – All Graduating High School Seniors or Transfer students, and Current HBCU students must show proof of enrollment. – Minorities – African American, Hispanic, and Native American. You, the applicant, are responsible for completing and submitting all information required. – Submit a 350 word essay answering the following question: Why did you choose to attend a Historically Black College or University? Carefully review your entire essay before submitting it. Notification throughout the application process will be by email. Students who fail to use a valid active email address or who fail to check the email account regularly may eliminate themselves from consideration.